It’s so cold! Well, not as cold as it was when we woke up but it’s still pretty cold out there so we haven’t been out of the house today. The little one also has the 'sniffles' so I don’t want her to get any worse by going out in this chilly weather as it’s almost her favorite celebration – the Halloween! On days where it’s not this cold, she has 2 favorite things to do. One is of, course, biking. The other one is to stay in the back porch to watch the different birds that come to our back yard. Dad got her a bird feeder not too long ago. So we put it in the backyard to attract all the birds that we see going in the neighbor’s bird feeder. It attracted all right but not birds…squirrels. Ugh. Nice, eh? 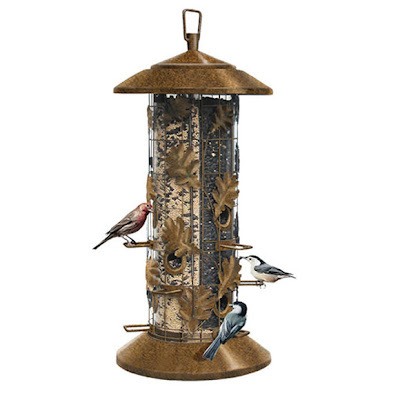 The site I found this has a lot of other really nice looking bird feeders that I took me a while to decide which one I want. But I had to make choice, so a choice was made. And this is the one I want. Do Painted Buntings visit your place? They are sooo beautiful -- well, the Males are (like most Birds). Taking photographs of that and the Crested Caracara were part of the itinerary on our latest FL vacation.